Posted on July 28, 2011 by D.J. Posted on July 17, 2011 by D.J. 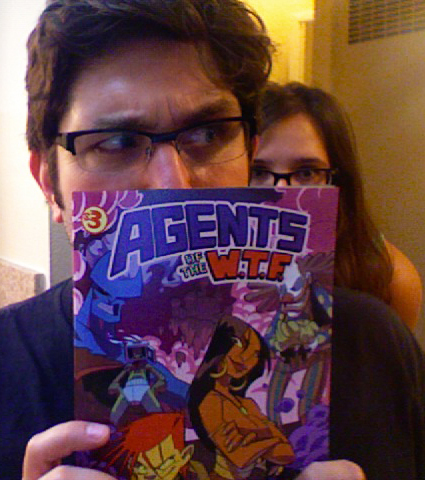 Yes, this is an early, poorly timed announcement due to the fact that the San Diego Comic Con will fulfill all your comic needs for a while, BUT Adam P. Knave and I collected our AGENTS OF THE W.T.F. stories from POPGUN 3 & 4 into one handy comic that we’ll be selling at the Baltimore Comic Con in August! When the proof copy from Ka-Blam arrived, with that glorious Matteo Scalera art, those crisp Palao Ferrante inks, Antonio Campo‘s lovely colors, Thomas Mauer‘s letters of power, and that Cara McGee book design snazziness — I just had to show it off!